I grew up with a vegetarian Indian mother who is passionate about health and cooking - so I was lucky to be at the receiving end of her nurturing and high vibration cooking. Thus, when I think about what my go-to comfort food is, I think what is light on my stomach, nutritious and delicious. Luckily, quite a few foods come to mind. The first that will usually come to mind that is also calming for the mind and body is Mung Daal. Today, I share my mung dal recipe passed down from my mother, to you. Mung beans are high in B Vitamins (perhaps this is why it calms my mind? :) and also contain Vitamins C, E and K. Mung beans also contain several minerals such as calcium, iron and magnesium. This therefore helps to make Mung Daal a light and nutrient rich recipe that is delicious. One item my mother always emphasized with me about cooking was to never get fixated on measurements and to experiment with increasing and decreasing ingredients to customize each dish to your palate as well as any dietary preferences. This advice has served me well, giving me creative license to modify foods and I take pride in honing in on the essence of my mother's cooking while making slight adjustments for my more mild American palate. I highly encourage you to apply this advice from my mom. The photos above and below are of a good solid base for flavorful Mung Daal. Please note that it is possible to have daal without thadka. Taste your daal both with and without thadka to see if you appreciate the layers and complexity that simple thadka can add, not to mention the added health benefits. Begin sautéing the onion in the ghee. While lightly frying, add in the cumin seeds, salt, pepper, turmeric, asafetida. 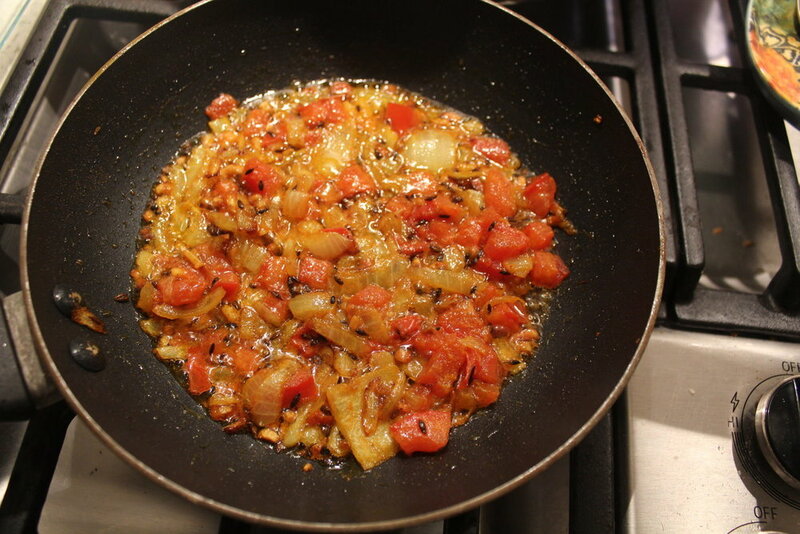 Once browned, add in the chopped tomato and continue sautéing until your thadka looks like the photos. 1 cup of rinsed mung plit mung beans (tip: split mung beans are yellow, whole mung beans, or mung beans with the outer husk, are green). 1/2 cup of any vegetables you would like to add - in the photos here I have used carrots and green beans. I also like to use leafy greens such as spinach and kale. Rinse the beans in water until the water you wash them in is void of most cloudiness that would come up from stirring the beans in a bowl of water. Bring the beans to boil in 2 cups of water, adding in veggies according to how dense they are. Meaning, if I am using carrots, I will add them in at the beginning and if working with spinach, I add it in towards the end. Once the beans come to a boil, reduce heat to medium or low and let cook for another 5-10minutes. Lastly, combine the thadka into the daal and heat together for a couple minutes. Garnish with Cilantro. Enjoy with rice or roti, or as a soup by itself. I am personally far more satisfied with either rice or roti to provide a complete meal. Voila! And there you have it. Mung Daal: Light, healthy, rich in vitamins and minerals! Enjoy and may you always be blessed to eat well.